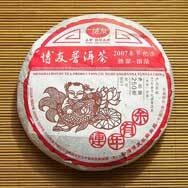 2007 Chun Jie Ji Nian means "2007 Spring Festival Edition", yet the tea cake was compressed in late year 2006. 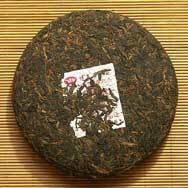 Chun Jie Ji Nian was first introduced in 2005 and this is the second edition of this series of tea cakes. Boyou have plans to continue producing this series until the year 2010. 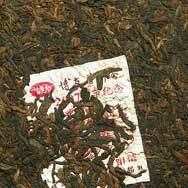 Their Shu Pu'er Bing Cha is recognized as one of the best among all the famous Pu'er factories. Просто кайф! =) После пробника беру целый блин, вкус - очень ровный, плотный, не горчит, то что доктор прописал, в общем. =) Рекомендую.